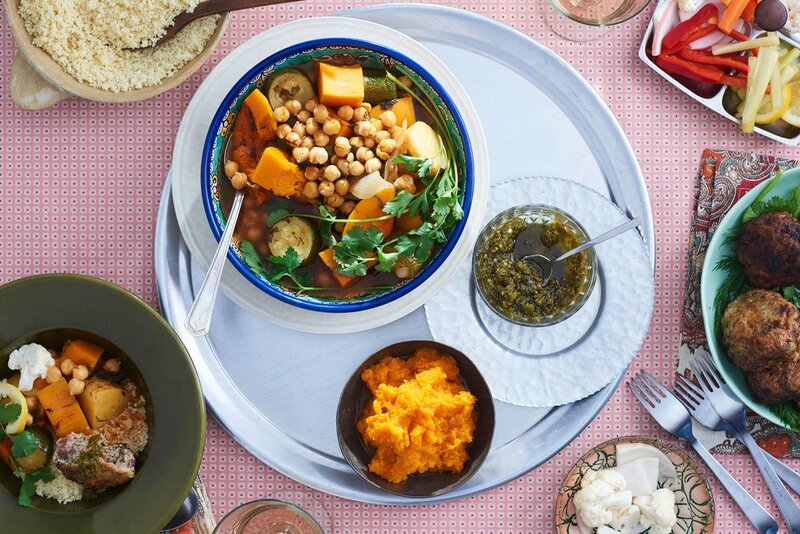 When Tsivia Tobi was a young girl in Gabes, a town along Tunisia’s coast, the tradition was to prepare couscous every Tuesday and on Fridays, to eat on Shabbat. 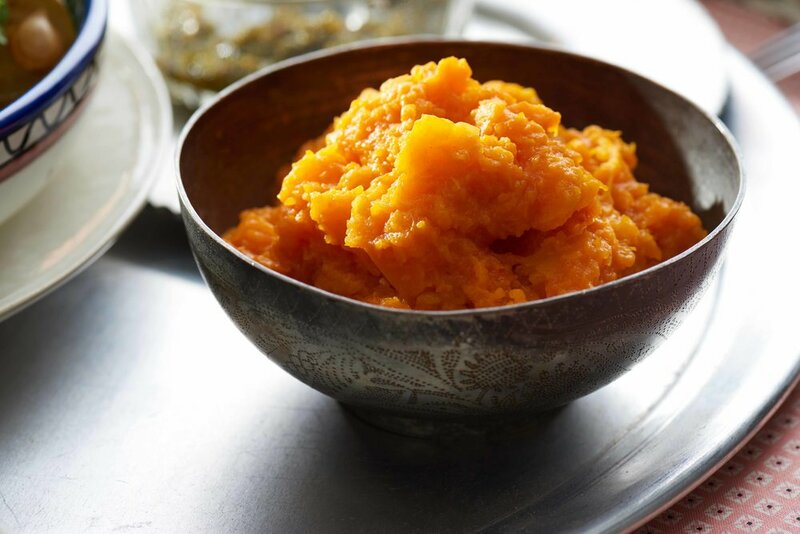 In her family home, couscous was topped with soup, meat and potato patties, stewed pumpkin and served with pickled vegetables or turshi on the side for everyone to add to their liking. Tsivia was only seven-years-old the first time she made couscous on her own. Her cousin tragically died in 1949 when a plane of young olim (immigrants to Israel) from Tunisia crashed. Tsivia’s mother Varda (or Warda in Arabic) left the country to collect the body of her nephew. The task of making the couscous fell to Tsivia. She set out for the butcher and recreated her mother’s recipe for Shabbat dinner. A year later, when the family of six moved to Israel, the Shabbat tradition came with them. Placed into an absorption center, they lived with other immigrants in tents and huts in camps where food was distributed through a ticketed ration system. The nascent years of the country were austere and Tsivia recalls a Shabbat when there was no semolina to make the couscous. Improvising, Varda took pasta and ground it in a mortar and pestle to make a facsimile of couscous for the base of the meal. Other recipes from Tunisia were bent and adapted somewhat to fit their new home. At times, Varda substituted different types of fish for one another, but Tsivia’s daughter Renana explains “with time, my grandmother found most of what she needed.” Varda passed down the recipes to Tsivia in Judeo-Arabic, a language much like Yiddish or Ladino that blends Hebrew with the local language of where Jewish families settled in North Africa and the Middle East. After college, Tsivia worked as a middle school teacher, expanding her cooking repertoire when she married a man whose family had Yemenite roots. Her mother-in-law taught her to make Yemenite soup and a flatbread called saluf. But, it was the Judeo-Arabic of her mother that helped her open doors to homes and kitchens across Israel. She returned to school when Renana and her siblings were adults, pursuing a PhD in anthropology. For her doctorate research, she traveled to moshavs (small agricultural villages) in the south of Israel speaking with women in Judeo-Arabic about their life. Her book “From Bride to Mother-in-Law,” helps capture the traditions of these women with chapters on clothes, jewelry, and cooking. 1. In a large stock pot, heat 3 tablespoons of olive oil over medium heat. Add onions, carrot, celery, turnip, parsnips, parsley, cilantro, and dill and saute for 15 minutes until vegetables soften. 2. Stir in tomato paste and 1 ½ teaspoons of salt and sauté for 1 minute. Add the stock and 4 cups of water and bring to a boil. Reduce heat to low and simmer for 30 minutes, partially covered. 3. Add the potatoes, butternut squash, and zucchini and simmer for 20 minutes until softened. Add the chickpeas and simmer for 10 more minutes. 4. Add 2 teaspoons salt and 1 teaspoon pepper. Taste and adjust for seasoning. 5. Remove from heat and stir in ½ cup of cilantro. 6. To serve, spoon ½ cup of bulgur into a bowl, top with soup and meat patties. 1. In a medium saucepan, cover the potatoes with one inch of water and place over high heat. Boil until easily pierced with a fork, about 10 minutes. Strain and transfer to a large bowl. 2. Mash potato with a fork until creamy (some small lumps are ok). Add the onion, garlic, ground beef, ground turkey, parsley, cilantro, dill, salt, pepper, and mix until evenly combined. 3. Lightly beat one egg and add to the mixture, combining evenly. 4. Shape ⅓ a cup of the meat mixture into a 1 ½ inch patty. Repeat with the remaining mixture. 5. Roll each patty in the flour and move to a resting plate. 6. Heat a quarter of an inch of oil in a heavy bottomed pan over medium-high heat. Lightly beat the two remaining eggs. Dip patties into egg and place in hot oil. Fry in a single layer, being careful not to overcrowd the pan (you can have two pans going at once) for 5 to 7 minutes on one side, then flip and cook for an additional 3 minutes. Make sure the oil doesn’t get too hot or start to burn, turning down the heat if necessary. 7. Place patties on a plate lined with a paper towel. 8. Serve immediately in Merget Kaski. 1. In a medium pot, bring 2 quarts of water to a boil. Add pumpkin and cook until soft, about 15 minutes. 2. Drain water from pumpkin, transfer to a large bowl and let cool for 10 minutes. 3. Add the lemon juice, olive oil, garlic, salt and paprika and mash together using a fork or potato masher until smooth. 4. Serve room temperature or chilled with Merget Kaski & Kofta. 1. 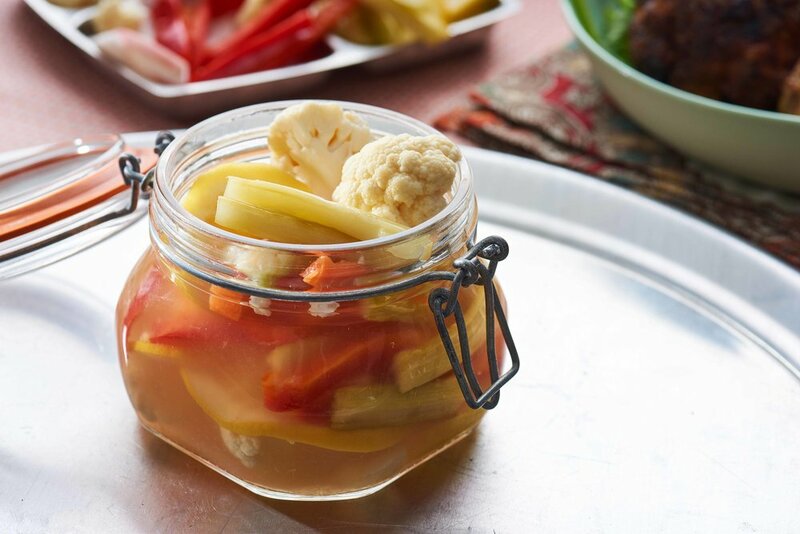 Place cauliflower, carrots, celery, turnip, red pepper, garlic, and sliced lemon in a large nonreactive bowl. 2. Sprinkle salt over the top and add lemon juice. Mix well, to combine. 3. Fill each mason jar with the vegetable mix and pour ⅓ of the remaining liquid in the bowl into each of the jars (should fill ¼ of each of the jars). Fill each jar with water to cover the vegetables and place lid on tightly. 4. Let rest on the counter at room temperature for four hours, then move to fridge. 5. Serve with Merget Kaski & Kofta. Will last up to 10 days.